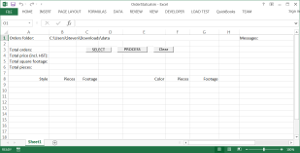 We develop custom Excel applications based of client's requests. 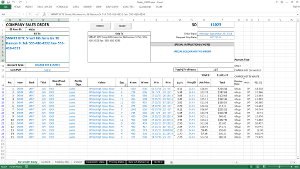 Below we provide a few screenshots and a brief description of an Excel application that we developed for a client that needed aggregated sales statistics based on his purchase orders. 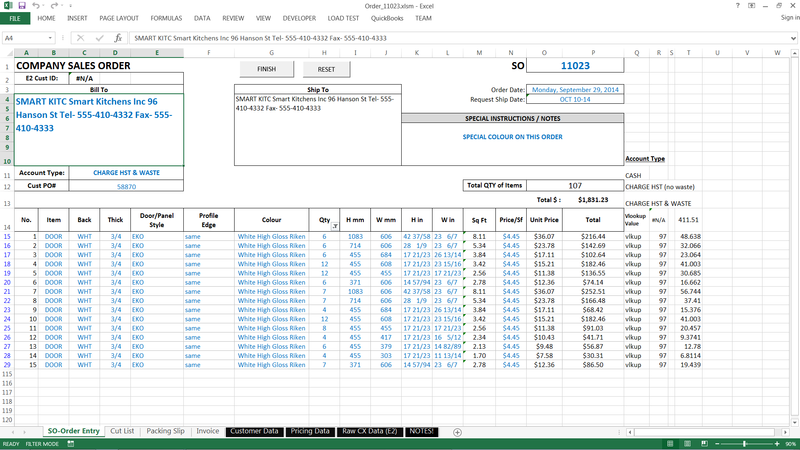 This screenshot shows what a typical purchase order looks like. 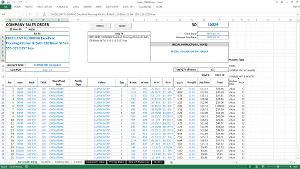 It is a separate Excel file with multiple spreadsheets including "Sales order entry", "Invoice", "Customer data" and a few others. 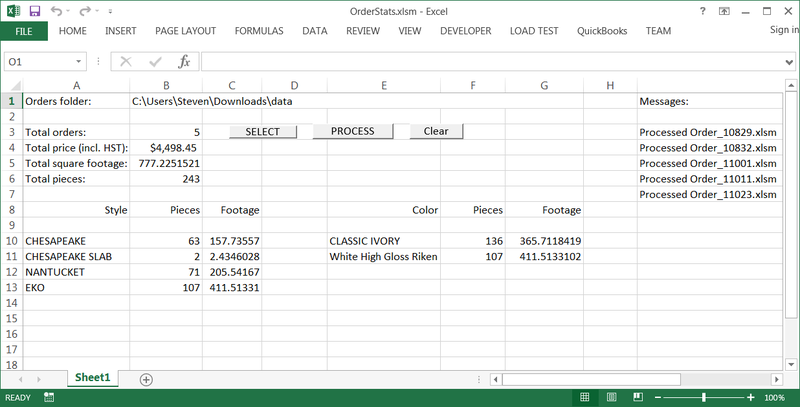 This screenshot shows another purchase order. Please note that this purchase order is in a slightly different format from the first one. 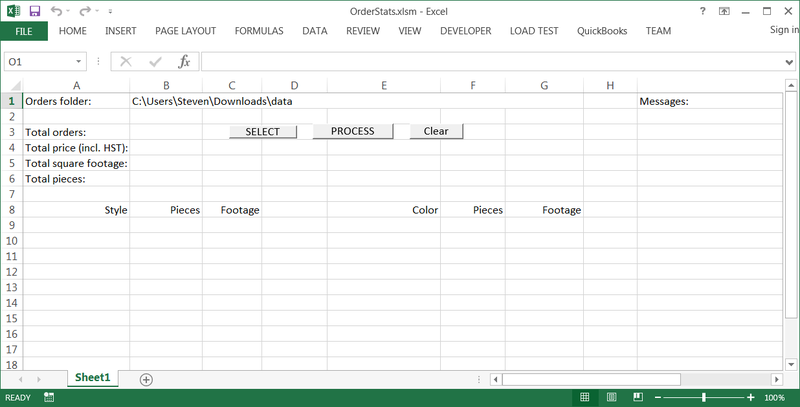 This screenshot shows the main screen of our Excel application. 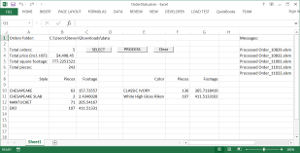 It has been written in VBA and uses the standard interface of a regular Excel spreadsheet. User selects the input folder with the purchase orders by pressing the [SELECT] button. The [CLEAR] button is used to clear the results from a previous processing. This screen displays the aggregated sales information provided by our application after it has finished processing the input order files. 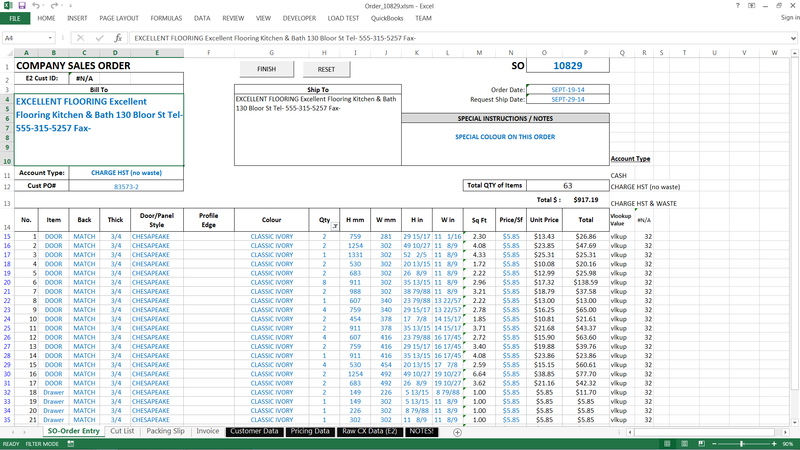 The aggregated results (statistics) include total number of orders, total price of all orders, total price including Harmonized Sales Tax (HST), total number of ordered item pieces, break-down of orders by item style, item footage and item color. ImportantSolution™ presents an overview of our past projects and technologies that we have used. When you visit each page, think of your business, company or your environment. A new solution might come from adaptation of an old idea to your environment! You might be in a big or small company, but just need one important solution to a vaguely-defined problem. Explore our other websites for more information.